1. 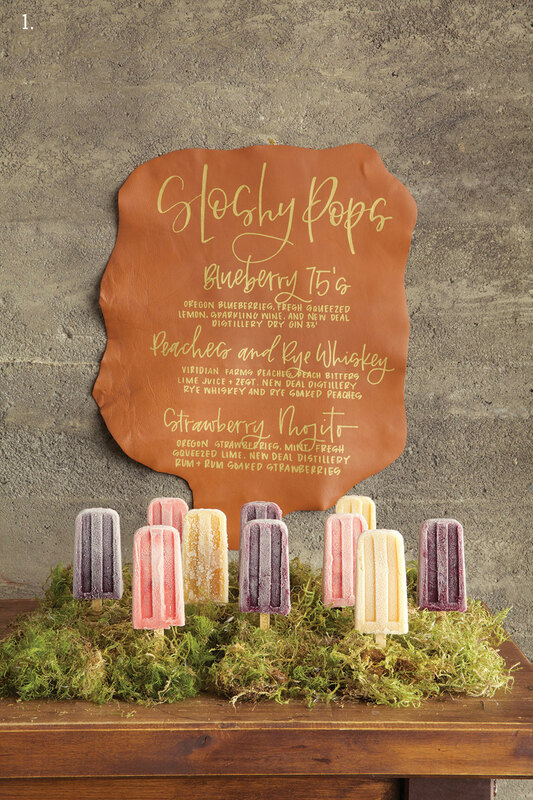 The alternative dessert bar menu pairs gold calligraphy with burnt-orange leather, and features Portland-based Sloshy Pops’ three flavor-jammed boozy popsicles for the occasion. 2. 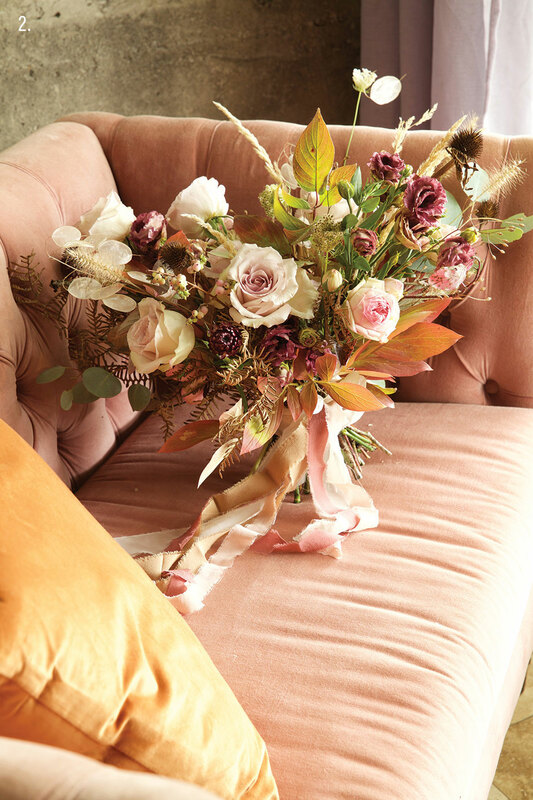 Salem-based Ali Briskey Designs crafted this exquisite bunch of blooms, including Keira garden roses, amnesia roses, local antique lisianthus, snowberry, strawflowers, Queen Anne’s lace, grasses, dogwood and peony foliage and coneflower centers. 3. 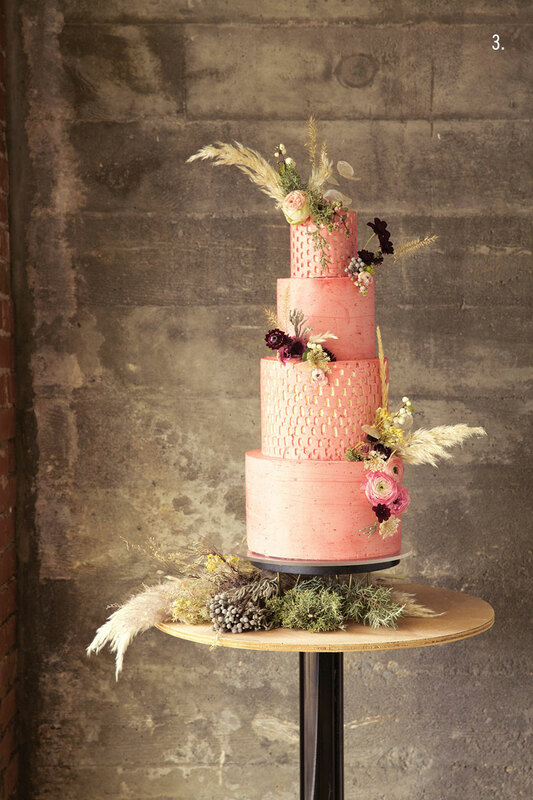 Bend’s Foxtail Bakeshop designed this decadent four-tiered cake, rich with texture, color and taste. The lemon verbena cake is accented with juniper cremeux and raspberry vanilla bean jam and finished with raspberry Italian butter cream. Cascading flowers provided by Ali Briskey Designs. 4. 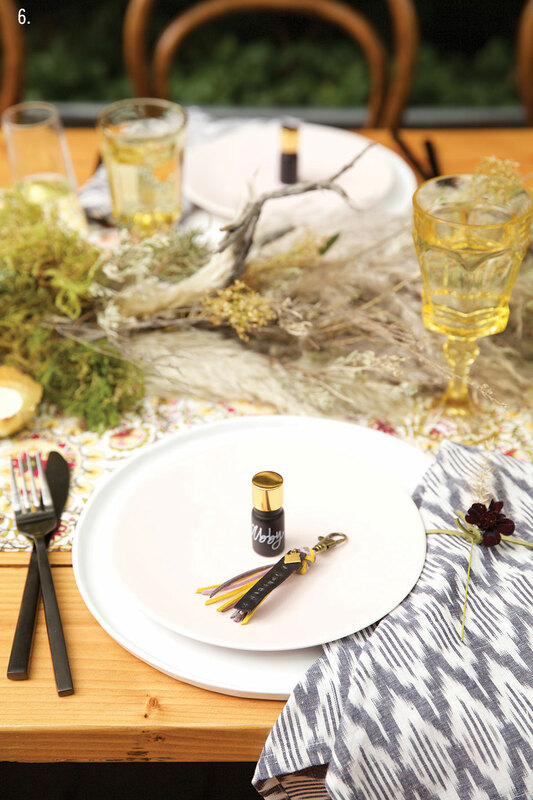 Bend’s LoilJ’s handmade suede and leather keychains serve double duty as wedding favors and place cards. Guests’ names and table numbers are hand-stamped on each piece of suede. 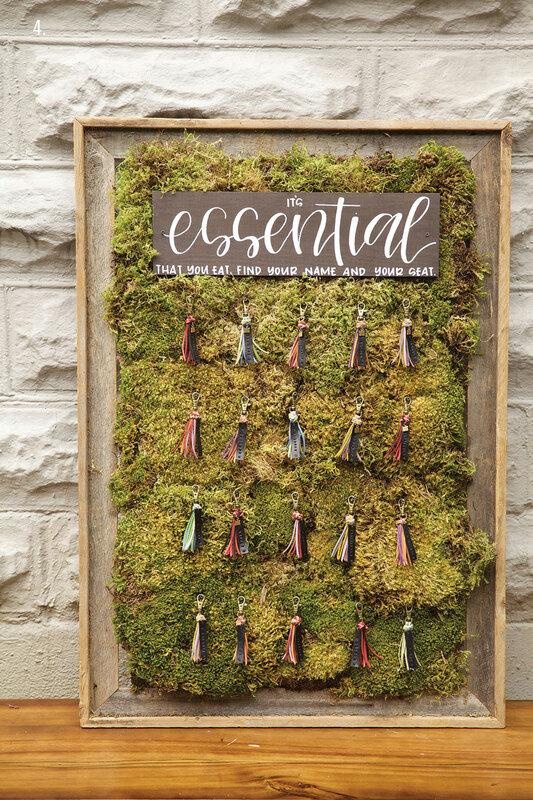 As a final treat, guests can soak the suede tassels in the essential oil as a fragrant diffuser keepsake. 5. 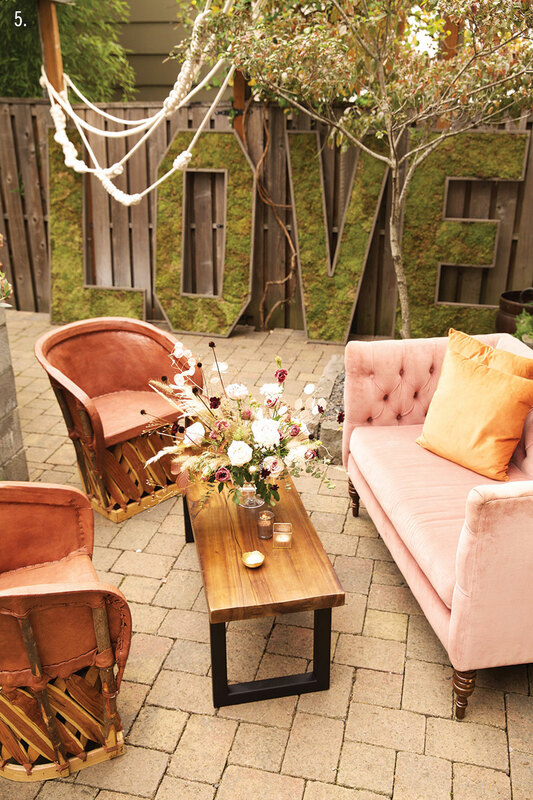 With comfort and luxury in mind, a lounge area featuring Leather chairs and a velvet settee are complemented with touches of wood, gilded votive candle holders, macramé wall hangings and a fragrant table arrangement of eucalyptus, roses, lunaria, porcelain berry, pampas grass and locally foraged grasses, among other blooms and dried bits. 7. A vibrant table runner is layered with black flatware and slate gray patterned napkins and topped off with touches of suede. 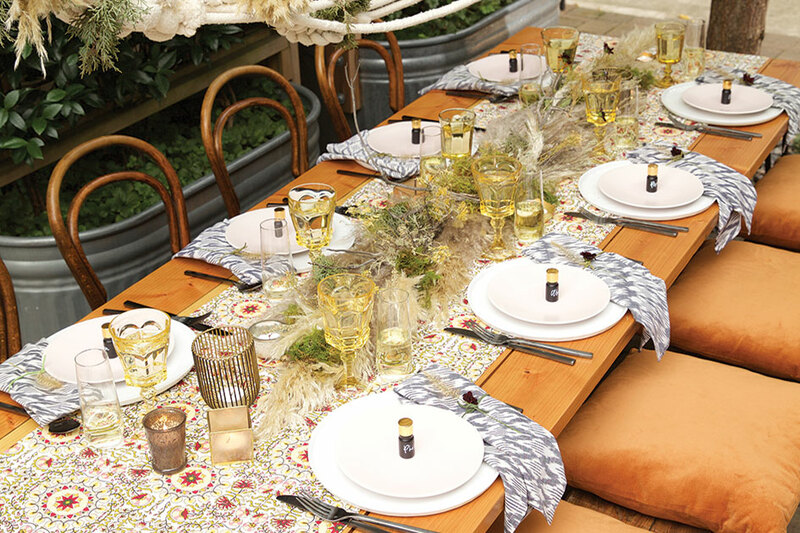 The centerpiece features pampas grass, desert sagebrush, juniper and dried manzanita branches with wild sprouting blooms. “[It’s] visually appealing and something a bit wild to experience,” says Elvebak.